Pip is growing so fast that I refuse to let a coupon for a shoe store expire! If it happens, I feel like I'm just throwing money away. When I recently received an offer for $10 off a $30 purchase at Payless, I knew we could put it to good use. As we arrived, we found that there was a back-to-school sale happening, but honestly, there's nearly always a sale of some kind going on at this store. The salesperson informed me that the coupon could be used on any purchase, including sale and clearance items, so that's where we started. Pip and I spent a little time trying things on and comparing prices of similar styles. We left the store with three pairs of shoes (two for her, one for me). 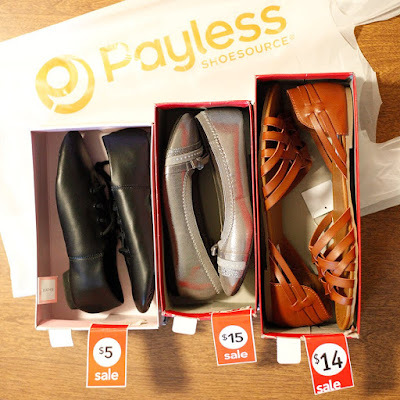 I was shooting for spending exactly $30 to get the maximum savings, but the $14 pair I selected for me--just a shade cheaper than most of the $15 sandals--were my favorites. 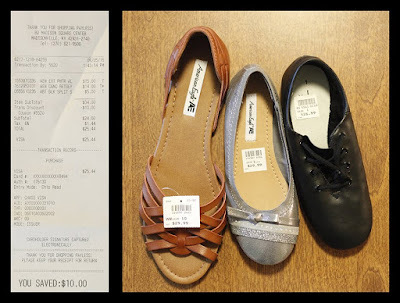 I threw the dance shoes in for Pip for $5, knowing that she'll soon outgrow the pair that she has at home. Just the sale prices would have been a decent deal, totaling $34. But then with the coupon I saved an extra $10, bringing the pre-tax total down to $24. It's looking even better, right? When you see the original price of each pair, you'll understand how much fun this shopping trip was! That's a savings of about 72%! For an added bonus, the receipt has a survey at the bottom that I can answer for $3 off my next purchase of $9.99 or more. I will answer that survey and I will not waste the discount. Even if there is not another pair of shoes I'd like to buy before it expires, they also carry socks, purses, jewelry, accessories, and sunglasses. I'll get something, either for us or as a gift for someone else, during this sale or the next. I need you to come shop for me!